Discovering peppers of color led to what is now my favorite pepper of all time, the Italian sweet pepper. Italian sweet peppers are at the heart of any great sausage and pepper sandwich you’ve ever had. And they are the key ingredient in my scallopini. 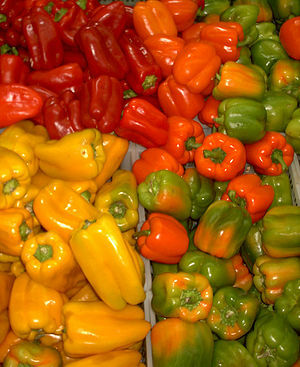 Italian Sweet peppers have a rich green color that gradually turns brilliant red. The flesh of the pepper is medium thick and the fruit is slightly curved, tapering to a pointed end. These peppers can grow as long as 12 inches but are usually between 7 and 8 inches long. Raw, they are sweet all on their own or as an addition to a salad. Cook Italian sweet peppers and add a sweetness, richness and flavor to just about any dish. So, even though I still raise red and yellow bell peppers, I make a lot of space in my garden for the Italian sweet pepper also known as (aka) the frying pepper. In my zone, peppers that are started 8 weeks before my last frost (around May 15th) just aren’t big enough or strong enough to set fruit before the middle to end of July. As a result, if I started plant when the seed packet said to, I’d only get a few peppers from each one. If I start the plants indoors and early, I get a glorious crop from all my plants! There are a couple of other reasons I use these kits. For one thing, I’ve had the same kits for more than 15 years and they still work for me. For another, the kits ensure that your seeds and seedlings get just the right amount of water while sprouting and growing. Not too much – not too little — because they use capillary mats in the cell system and take advantage of osmosis. Because of the system design, I never have to contend with damping off when using these kits. I fill the cells with Gardener’s Supply germinating mix, place 4 seeds in each cell…two in opposite corners. Then I cover each cell with a bit of sphagnum moss, put on the plastic top and set the tray on my heat mats. I fill the tray with water and then check in 4 or 5 days to see if the seeds have sprouted. NOTE: You have to check your seed trays every day to make sure there is enough water in them. Because I sit them directly on the heat mat, the water evaporates pretty fast. If the seeds dry out at any time during the sprouting or early growing stages, the plants will either die, outright, or just malinger – no grow very much at all. As soon as the seeds sprout, I lift off the clear cover and drop the light to within 2 inches of the cells. As the plants grow, I keep the trays watered and I keep the light as close to the seedlings as I can without touching them. If the light touches them, even a fluorescent light, it will burn the baby’s leaves and slow its growth. By the way, peppers and tomatoes don’t work and play well together so don’t plant tomatoes on one side of your trellis or fence and peppers on the other. The pepper plants will grow but their growth will be stunted. And the peppers themselves will be small and prone to rotting. Peppers have shallow roots so water them when they need it and don’t hoe too close. Also, stake peppers so that when fruit loads are heavy, the plants don’t topple from weight or high winds. I use old, inverted tomato cages. That sounds odd but the cages work better than anything else I have tried. Next week, bugs that bug peppers….and some fabulous recipes for all those luscious, red peppers you are going to harvest. This entry was posted in Gardening Tips, Organic Gardening, Tools for the Organic Gardener and tagged Gardeners Supply, how to grow bell peppers, how to grow sweet italian peppers, red bell peppers, sweet italian peppers, yellow bell peppers. Bookmark the permalink.